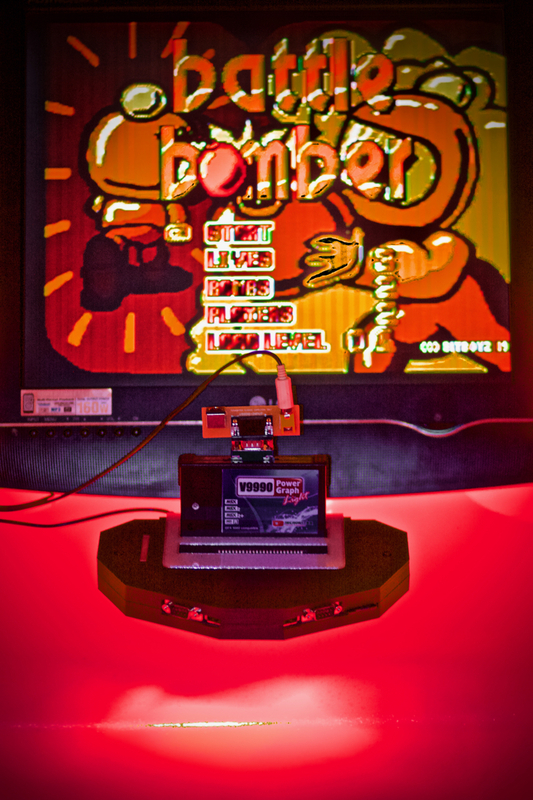 The Tecnobytes V9990 Powergraph light is a cartridge based on Sunrise GFX9000 for any generation of MSX computers, built around a Yamaha V9990 Video Display Processor. The never released Yamaha V9978 VDP (Video Display Processor), which was supposed to be in the MSX3, is the precursor of the V9990. 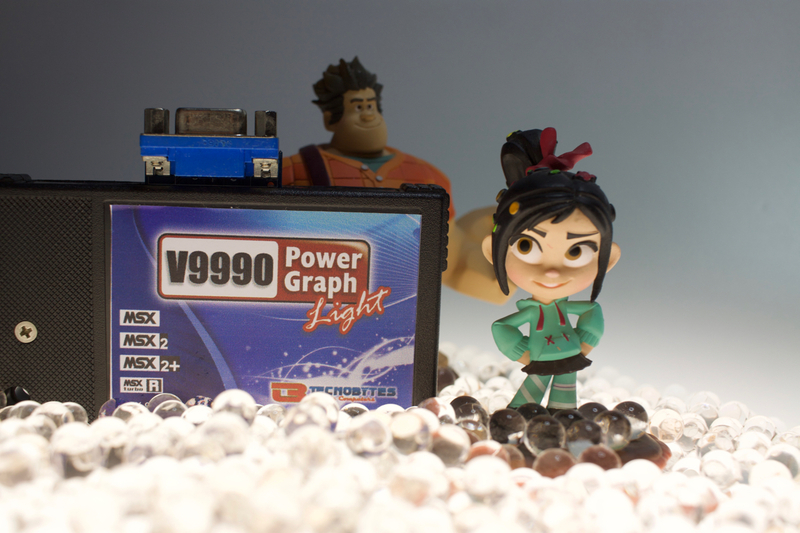 Compared to the V9990 Powergraph, the light version has the same specifications but ships only with a male DE-15 subminiature RGB connector instead. The RGB output of this new version remains VGA*** pinout compatible, including 5v on the pin 9. It will bring the same quality as before, but in a small size cartridge. The s-video / composite video adapter comes included in the package at no additional cost. The shipping forecast for the new batch is November 2018. I received mine from the first batch two weeks ago. It is a solid build piece of hardware for a fair price. Keep in mind to order the SVHS/RCA adapter board separately. I have a normal big one from previous batches. Great products, from great developers! that´s what I want to hear! Thank you guys! I was already thinking about buying one and the picture convinced me! So I just ordered one! @hamlet would this work on the zemmix? My ChibiAkumas game should be ready in a couple of months (with V9990 support), I'm hoping the V9990 will arrive in time for me to test it! Testing on real hardware is a very good idea for V9990, the emulation is not perfect, issues are still found quite regularly and also the real hardware has some quirks that don’t occur in emulation (like palette splits causing glitches). Hi, has anyone already received any? This month we will still start sending !! Latok, your purchase was confirmed by PayPal in 2018-02-06. We will start sending all Powergraph Light cartridges in March, 2018. Thanks for your purchase! Gentlemen, every payment done by PayPal generates an automatic invoice, which is sent to the buyer's email. If you have any questions, please contact us at tecnobytesbrasil@gmail.com. Thanks for the heads up! Looking forward to it. Are you providing track number to the people who we ordered one? I don't receive yet any email about it, and it's a good idea to check status in courier company to avoid reject and others problems. Please, can you provide it? It would be grateful to know if it has already left. Dear Tecnobyters, tomorrow we will start shipping the Powergraph Light (04/05/2018). We will send the tracking number to each person individually after submission. Track-id received!! Thanks a lot!!! I did not (yet) receive a tracking number. Are you still busy with the batch? Thanks for your reply. I have sent you a PM. Powerligth received today, but I am not able to make it work, someone can tell me, thanks. Recieved mine in Japan... I'll be using it for testing of ChibiAkumas V9990 in the next few weeks! Got mine yesterday, It took only a week to arrive from Brazil. Hopefully can manage to test it this weekend. Does anyone have the pinout for the VGA connector? Regular VGA pinout apply afaik. Only the first revision has this ugly male connector with non-standard pinout btw. Not quite regular VGA as it also has CVBS out and S-Video out on the same connector. I just tried 2 different DeLock VGA->SCART cables but no luck. No picture (I am using a SCART to HDMI converter). Does anyone know a working VGA-SCART cable? I'd like to try out the RGB output. It was a mistake to advise me a cable that was not, and thanks to Retrocables it works. which is the right cable from retrocables site? Hi Journey, contact widht them. Thanks for the link. I've ordered a few SCART/VGA cables to test with. I have now a nice picture using a GBS 8200 (V4.0) with 2 male-male VGA cables. Just got my VGA->SCART cables frm retrocables (Spain). First test with the VGA->SCART cable which has an USB plug for powering the RGB switch signal works great (in combination with my SCART->HDMI converter). I also have a GBS 8200 (V4.0) connected with 2 male-male VGA cables but no signal. One male VGA cable connected to vga out and go to monitor one male cable from Powergrah lite to VGA in of GBS 8200. Don't work. How did you make it work? I ordered cables with external (one with USB and one with HDD plug) power options needed for the RGB switch signal. Once again, there is a new batch of PGlight's!